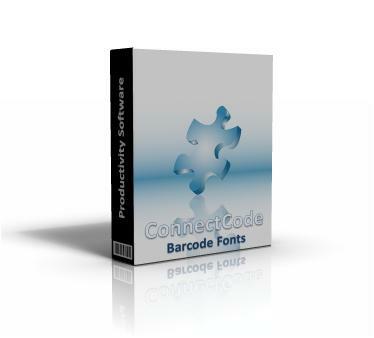 ConnectCode offers a complete and professional barcode font pack for your business and supports the symbologies EAN , Code 39, I2of5, Code 128 , UCCEAN , ITF14 and UPC barcodes. ConnectCode can be used independently with a software Encoder or with other softwares like MS Excel, Access, Word, Reporting Tools, in Visual Studio projects, text editors, graphics software. The fonts are well tested and flexible enough to meet the changing demands of your business. Additionally, ConnectCode also contains an Add-in for Excel that mass converts a column of data into multiple barcodes. More information can be found at www.barcoderesource.com. "We chose to use your product because it installed flawlessly into excel and we were able to document the creation process so that staff can produce the barcodes in 4 simple steps." "The font allows for the barcode to be consistantly sized and placed regardless of what data the initial page of the document uses to generate its code." A barcode font is a specially designed font that allows you to specify and generate barcodes on normal text characters. Most softwares today that support text and font handling will be able to work with the font and support barcode printing. The versatility of a barcode font makes it a easy to enable barcodes in office applications, third party softwares and enterprise projects that support text display. ConnectCode comes bundled with an advanced software Encoder that helps you validate data input, generate check digits and add start/stop characters. A special feature creates images out of the barcode fonts, while giving you flexibility in setting the resolution, dimensions and boundaries of the resulting bitmaps. There are also Word/Excel Macros and Crystal Reports formulas included to carry out the tasks of the Encoder mentioned above. Sample source code also provides reference implementation of the Encoder if you are thinking of bundling our fonts with your application. The ConnectCode package includes TrueType, OpenType and PostScript fonts. Human readable fonts for Code 39, Code 128B and I2of5 are aslo available. This trial includes the demo versions of all the supported barcode fonts, the software encoder and the VB macros scripts. All our barcode fonts come with maintenance upgrades. The horizontal lines on some barcodes in the Trial version will be removed in the registered version of ConnectCode.